Digital Realty Earnings: Will the Amazing Returns Continue? Digital Realty Trust just announced its first quarter results. 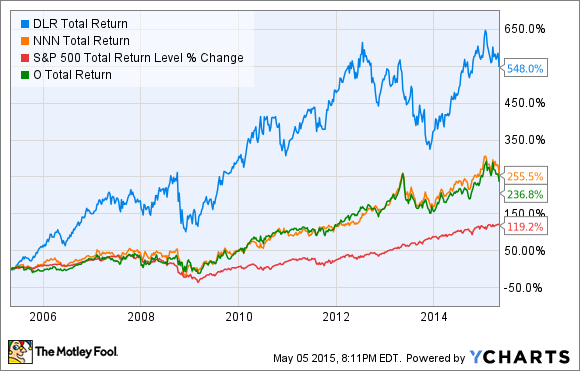 Can the company's record of outperformance continue? Digital Realty Trust (NYSE:DLR) just reported its first-quarter earnings, and the results and the company's outlook look pretty good, but not stellar. Digital Realty has been one of the best-performing real estate investment trusts in the market over the past decade, so are the latest results strong enough to keep shares rising? For the first quarter, Digital Realty's funds from operations, which is widely considered to be the best indicator of a REIT's profitability, rose to $1.56 per share from $1.22 in the first quarter of last year, a 28% gain. However, the "core" FFO, which excludes items that don't represent core expenses or revenue streams, dropped by a penny to $1.27 from $1.28 a year ago. Both revenue and EBITDA increased slightly year over year, and CEO A. William Stein indicated that landlord economics are improving and he expressed optimism on the company's ability to create value for shareholders. A slightly more optimistic forecast, or is it? Digital Realty revised its forecast for its 2015 full-year core FFO from $5.03 to $5.13 per share, up slightly from the $5.00 to $5.10 range the company had previously projected. However, the forecast for rental rates on renewal leases was dropped from "slightly positive" to "slightly negative" on a cash basis, and from "up double digits" to "high single digits" on a GAAP basis. Granted, those are all vague terms, so it's unclear just how much of a negative revision that is, if at all. After all, the projected rental rates could rise by 9.9% as opposed to 10% and still fit into those phrases. Over the past 10 years, Digital Realty has delivered average annual total returns of 18.7%, far better than popular REIT peers Realty Income (12.1%) and National Retail Properties (12.7%), and more than double the S&P 500's average return of 7.8% during that time. This is incredible performance over such a long time period, and it raises the question of sustainability. On one hand, the need for data storage facilities continues to grow exponentially, and when it comes to data centers, Digital Realty is in a class by itself. On the other hand, the earnings results, while good, don't really support such a high growth rate in the foreseeable future. The year-over-year growth in revenue (4%), EBITDA (2%), and core FFO (negative 1%) don't indicate a double-digit growth rate. The full-year FFO guidance is just 3.4% more than 2014's FFO, even at the high end of Digital Realty's estimates. Plus, the company is aggressively pursuing the strategic sale of several of its properties to put that capital to better use for shareholders, in what it calls its "capital recycling" plan. While this approach could indeed produce strong growth in the long run, it's likely to have the opposite effect until the assets are sold. In a nutshell, I think the potential to see more rapid growth and shareholder returns well into the double digits is there but is likely to be preceded by a period of less-than-stellar returns. Having said all that, I'm still bullish on Digital Realty on a long-term basis, and think that it's definitely worth a look. If the share price shows any weakness over the next several months, I might just be a buyer.